Martinsville truck race qualifying is up next. The NASCAR Truck Series race will take place in a few hours. First, they’ll set the grid for the 0.526-mile paperclip race track in Ridgeway, Virginia. View the full 2018 Martinsville truck starting lineup below. They had two practice sessions scheduled for yesterday, each of those rained out. This will be the first time these teams touch the track. No practice, just go. 1 minute into round one, Kyle Benjamin is around. The red is out with several trucks on the race track. No damage, single truck spin. 8 minutes remain in round one, the red is out for the second time. Landon Huffman got loose off the corner, he went around. DJ Kennington had no way of avoiding it. They made nose to nose contact at low speeds. Huffman is making his first start. He didn’t even get a lap in. 5 minutes remain, Tyler Ankrum has never been in truck below. He’s a 4-time winner in the NASCAR K&N Pro Series in 2018 alone. Truck practice rained out entirely yesterday. In the first laps for Ankrum, he’s knocking on the door of the top 10! Grant Enfinger wins round 1 of NASCAR Truck Series qualifying at Martinsville. Halfway in round two, Todd Gilliland sits at the top of the board with a 19.98. Enfinger is 2nd, 0.01 seconds slower. 1 minute remains, Justin Haley is sitting in 13th. The top 12 advance. Haley is on track and flirting with a transfer time. He cooks turn four! He was 0.05 seconds to the good down the back stretch. The slip up in turn four will mess up both this lap and the next one. Haley will not advance. Todd Gilliland hangs on to win round two of NCWTS qualifying! Tyler Ankrum will make his first truck series start from the 19th position. The green is out on the final round. Six trucks head out immediately. Ben Rhodes is the quickest of the trucks so far. He turned a 20.019. 2 minutes remain, Gilliland is on the truck. He heads to the top of the board! Burton, and Gragson also jump over Rhodes late in the session. 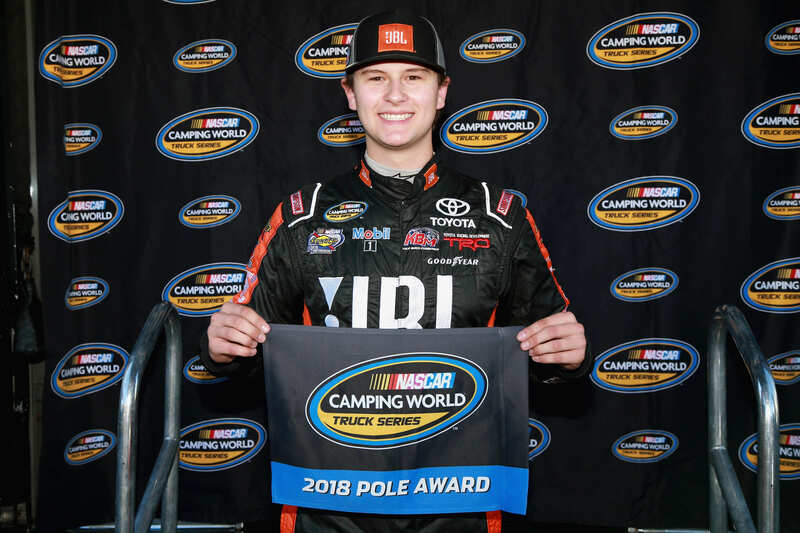 Todd Gilliland will start from the pole in the truck race at Martinsville Speedway! This will be his first career NASCAR Truck pole. View the 2018 Martinsville Speedway starting lineup for the NASCAR Truck Series below. The trucks will take the green for the Texas Roadhouse 200 in just a few hours.